-Scheduled mostly on Sundays (with a few substitue Saturdays) and found on the class schedule in orange. **In order to streamline the registration process and to keep seminar day check-in time to a minimum, please fill out the attendance sheets below. If for any reason you think you may want to change your response on the attendance form you will be given an option after submitting the form to "edit your response." please click on the "edit your response" button and record in a safe place the URL that is given. This unique URL is the only efficient way for you to change your response. Thank you for helping us make the check-in, registration and administration of the seminar as efficient as possible. Based on this attendance sheet we will determine the exact location of the the Friday night class. We will close the attendance sheet and announce the final location of the class by Monday March 18. Please fill out the form BEFORE then. Thank you. Price is $35 for registered seminar participants and $40 for those not attending the seminar. March 16 & 17, 2013 Syracuse N.Y.
Justin, Ignacio and I just returned from training in Japan. This trip was spur of the moment as we decided to take advantage of the lull in gaijin practitioners in Noda. 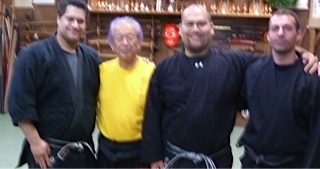 We experienced classes with Hatsumi Soke which only had around 25 people per class. I haven't experienced Soke's classes with so few people since my trip to Japan in 1992. We trained with Ishizuka sensei and his top disciples morning and night (when we were not attending Hatsumi Soke's classes). It was an intense and personal experience. 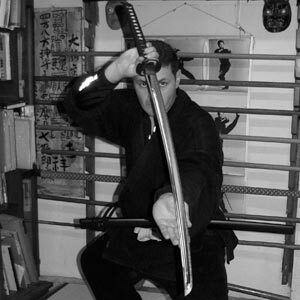 I view the members of our dojo as very fortunate; because of Kacem's generosity quite a few of you have been to Japan for training and have experienced what it is like training and living in Ishizuka sensei's dojo. For me the experience of training in Ishizuka's dojo has evolved over time. While always exceedingly generous, during this latest trip Ishizuka Sensei and his disciples were extraordinarily generous in their patience and what they revealed to us. Personally speaking this trip represented an opportunity for me to dive deeper into my practice and to aim for higher goals and standards for myself. I urged Justin and Ignacio to do the same and spoke to both of them in some length about the opportunity. The real purpose of this email is to extend this invitation to all of you. Over the last few years we have all experienced heart-wrenching difficulties and challenges (including Kacem). Many of you have told me of the pain and difficulties in your life and I have in turn told you of mine. Many of you feel you are in some of the deepest, darkest and melancholy times of your life. I can tell you, we are all in the same boat, almost all of us have or will experience the same or similar hardships in life. However we all have a kinship in Ninjutsu and Ninpo. This art was created in hardship and its practitioners persevered through the pain. This is the only reason why to this day we are blessed to be able to experience the art of Ninjutsu. Let us all help each other pull through the hard times. I strongly encourage all of you to join me Justin and Ignacio and reinvigorate your commitment to yourself, the dojo, and The Art. Begin shedding all the excuses in your mind, begin to strengthen your body and continue to dive deeper into your heart to find the benevolence within. We all have the opportunity to make a new beginning, not by changing our immediate situation but by changing our interpretation of our current existence. In my opinion, the internal interpretation and manipulation of one's own self and view of one's own life and the world around us is the highest level of "kyojitsu tenkan ho" that one can practice. I invite all of you to begin practice anew, with a beginner's mind, with enthusiasm and openness to change and to look forward to the future ahead. Let us practice together and renew our commitment to ourselves, the dojo, and The Art.